I like to leave a little of the marinade on the artichoke hearts to soak into the bread; look for jars that list oil before water in the ingredients. Removing some of the crumb from the bottom and/or top halves of the baguette gives you a bigger filling to bread ratio (and cuts out some calories) but is totally optional. So are homemade baguettes, but they taste amazing and are actually easy to make. I've also made these sandwiches with cream cheese in place of the mozzarella; just spread the cream cheese on the bottom half of the baguette, then top with the artichoke mixture. Or you could mix softened cream cheese right into the artichoke mixture. When I took my first bite of one of these sandwiches back in the spring, my immediate thought was that they would be really good with some tomatoes on the side (because putting tomatoes directly on a make ahead sandwich would make a soggy mess). When I pack off-farm lunches during the summer, it's such a treat to include a small container of halved cherry tomatoes or diced tomatoes, fresh from the garden vine and sprinkled with plenty of salt. 1. Mix the artichokes, basil, olive oil, salt, and pepper together in a small bowl. 2. Remove some of the interior crumb from the two bottom halves of the baguette (if desired), then divide the artichoke mixture evenly between them. Top with the mozzarella and salami. 3. Remove some of the interior crumb from the two top halves of the baguette (if desired), then spread each half with 2 Tablespoons of the olivada and place atop the salami. 4. 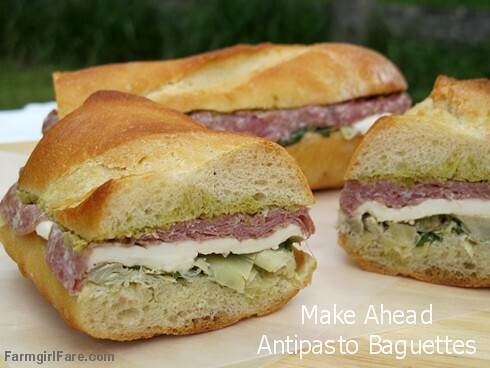 Press the sandwiches lightly to compact them and wrap each one tightly in plastic wrap. Refrigerate for at least 4 hours; they taste best made a day ahead. Serve with juicy, vine-ripened tomatoes on the side during summer. Olivada, also called olive paste, can be found at Italian markets and fancy food stores, but you can easily make your own by puréeing 1/2 cup of your favorite pitted, brine-cured green olives with 2 Tablespoons extra-virgin olive oil in a mini-chopper or food processor. I really love the bright, buttery flavor of Italian Castelvetrano olives (which are worth taking the time to pit), but even those readily available, pimento-stuffed Spanish green olives will work in a pinch (I removed the pimentos). © FarmgirlFare.com, becoming more flavorful (or at least more something) with time. We're going on a picnic this weekend and this will be the perfect picnic snack. Oh I love the sound of the olivada. I can think of so many uses for it.